Interactive Grid (IG) allows a great deal of customization to its toolbar and menus. The toolbar is implemented by a new toolbar widget (file widget.toolbar.js). Like most widgets the toolbar is configured with an options object given to it when it is created. The IG widget creates the toolbar widget but gives control over the content through advanced configuration as will soon be shown. A toolbar contains an array of control groups and each control group contains an array of controls. Controls can be: buttons, toggle buttons, menus, radio groups, select lists, text fields, or static text. What a control does is defined by an APEX action. Menus use the APEX menu widget. The menu option structure is embedded in the toolbar option structure. I have written about actions and menus before. [Update 5.1.1] The following example is updated to use the toolbarFind method. Here is what the toolbar looks like after adding the above advanced configuration code. [Update 5.1.1] The toolbar array returned by copyDefaultToolbar includes a method toolbarFind. This method is used to find any toolbar control group, control or menu item by id or action name. The id and action properties can be seen when you explore the structure as described above. You should not modify the initial array value of the toolbarData property but instead assign a new array as shown above. You could also just create your own toolbar content data. The following example creates a very simple toolbar with just a search field and go button and a filter button. Here is the resulting toolbar. Note that the declarative option Toolbar: Buttons Reset is still checked but no Reset button is shown because it doesn’t exist in the toolbar. 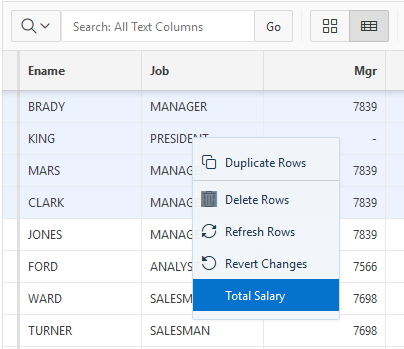 If you added another control group at the end of the toolbarData array in the previous example as follows then the Reset button will then be shown or hidden based on the Toolbar: Buttons Reset checkbox. Just because a button or menu item doesn’t exist doesn’t mean that the corresponding action doesn’t exist. An action is a named behavior along with its UI state (state includes hidden/shown, enabled/disabled, label, icon, and shortcut key). The toolbar and menus just provide the UI for invoking an action, or for toggle and radio group actions setting or getting its value. This is why you typically don’t need to specify things like the icon or label because it is taken from the action. The above examples should give a good idea of how you can move things around in the toolbar and menus but if you really want to disable or hide something you should do it through the actions API. Also if you want to add your own custom functionality it means adding an action and then adding a toolbar button or menu item to invoke it. Here is what this toolbar looks like. 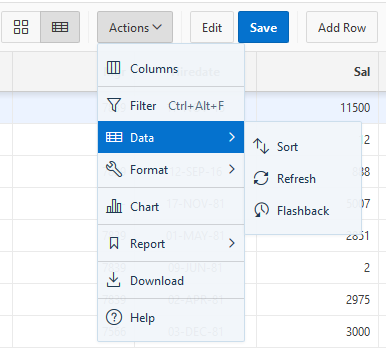 This next example shows how to hide the Data > Aggregate menu item and add a keyboard shortcut to open the filter dialog and another keyboard shortcut to save changes. This shows the effect on the Actions menu. Using the techniques introduced in part 1 you should realize how to add keyboard shortcuts for all Interactive Grids in your application from a single common function. Note focus must be within the IG for these shortcuts to work. Always first check for a declarative attribute that controls the toolbar or menus. For example set the Enable Users To: Download: attribute to No rather than use advanced configuration to hide the corresponding action. Some types of toolbar controls can’t be shown/hidden via actions; specifically text fields, menu buttons (or sub menus), and static text. To show/hide or enable/disable these toolbar controls you need to use the toolbar widget API. I’m not going to go into that now. You can read the code doc comments on your own and maybe I’ll cover that in a future article. You could also just remove them from the toolbarData structure. [Update 5.1.1] You can get access to the toolbar widget from the IG widget using the getToolbar method. Here is an example that may not be too useful but gives an idea how to control the toolbar. The following sets the value of the search field and then invokes the search action. See also the Sample Interactive Grids app page Reporting > Add Toolbar Button for another example of adding a custom toolbar button. Another thing people want to do is customize the Row Actions or Selection Actions menus of the grid view. This is possible but a little more involved because these menus are associated with the grid view rather than the IG toolbar. It should not be a surprise that these menus are implemented with the APEX menu widget. So if you know the DOM element id you can manipulate the menu using the menu widget API. In the future there should be an easier way to get at these menu elements. For now if you poke around you will find that the row actions menu id has the suffix “_ig_row_actions_menu” and the selection actions menu has the suffix “_ig_selection_actions_menu”. [Update 5.1.1] The previous sentence is still true but now there is a better way to get at the menus without having to know the element id. [Update 5.1.1] The following example is updated to show using the view rowActionMenu$ property and the new viewchange created flag. Here is the resulting Row Actions menu. 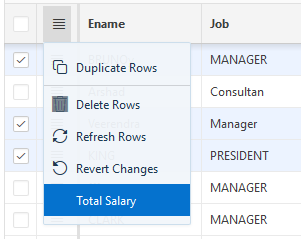 The menu action shows how to get the record associated with the row and how to use the model to extract the value of the ENAME column. I hope in the future there is an easier way to detect when the grid view (or any other view) first becomes initialized/shown. [Update 5.1.1] The following example is updated to show using the view selActionMenu$ property and the new viewchange created flag. Here is the resulting Selection Actions menu. This example shows how to get all the selected records. It then loops over them to calculate the total. More information about using the model API will be in a future part of this series. Delete the Actions Menu column. The above assumes the Static ID is emp change to your region Static ID. The resulting Interactive Grid with context menu open looks like this. The grid view column header popup is not really a menu; it is not implemented with the menu widget. 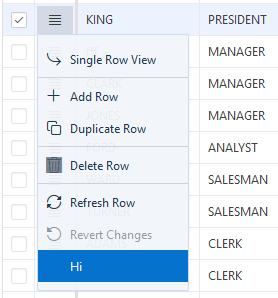 It is not supported or recommended to change the column header popup. You should now be able to customize the IG toolbar and menus. You may have lingering questions about how to do useful things from any actions you add. Some of these questions may be answered in the next part of this series where I'll cover programmatic control of Interactive Grids. What if I wanted to invoke an action of another grid’s toolbar? Consider I have 2 grids and would like to invoke the “save” actions of both grids upon clicking a (custom) button on one of the grids. How do I get to the context of the other grid to get a handle on its action? apex.region(“<static_id_of the_non-default_region").widget().interactiveGrid("getViews", "toolbar").context .. , but little stuck here .. Yes, I could just submit the page instead, if I didn't have two more grids on the page, that I do not want to submit with the same Save button ..
Hey John i was looking into interactive grid and found in js file of IG they are using H=”js-actionButton” which actually do the magic to Edit rows can you explain this in more depth !! How this triggers!! can we use the same for different reports !!etc.. Thank you really appreciate you’re efforts and time. I eventually found the wok-around. You would need to provide more information. I was not able to find the app and page where the problem happens. Hi John i have been following this blog post and it’s very interesting. I wanted to ask you if there is a way where by we can hide or colored different buttons in IG. About this JS i tried using it on Execute when page loads and in DA but it seems like i am not able to make it work . If you have some spare time just look into it. Error : Can not define push on undefined object.